'Verde Vase' is a small acrylic on canvas abstract floral painting of vertical format, created by American artist Amy Dixon in 2019. Featuring a rich palette made of teal, blue, green, soft pink, white, orange and lavender tones among others, the painting presents an abstracted depiction of a bouquet of flowers set inside a colorful vase. The complete abstraction of the background, made of a patchwork of ochre and green strokes, allows the flowers to stand out beautifully. Unframed, this petite acrylic on canvas painting is signed lower right. Amy Dixon’s loose, spontaneous canvases are full of life, energy and a glorious palette that warm the soul. Mostly her paintings convey this artist’s infectious joie de vivre and the pure and simple expressions of her creative soul. Her energetic brushwork results in many applications of paint are drippingly layered, etched, opaque in some places and translucent in others. “I am constantly thinking about the language of color and how it expresses the energy and spontaneity behind my work,” Dixon tells us. 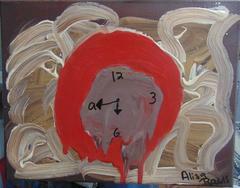 Her passion for art is reflected in her paintings which are a response to her intuitive and impulsive need to create.